Preface: In Wednesday January 17th Workshop "The Occasions of Poetry", Robert Pinsky told the class that if this was a year's workshop, he would have the students invent a new form and write a poem each week using that form. He then suggested that we try to use one word in a poem incorporating it as a noun, verb, adjective, with different shades of meaning. Do it so that it's not so obvious for the reader. He said that we should explore the word's etymology and its usage historically in the Oxford English Dictionary, a reference we should consult often. When Pinsky read the list of students to bring in a poem next week, he said, "Peter are you going to bring in a poem?" I said "Yes" but didn't know what to write. 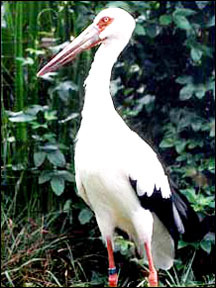 Then I recalled my extraordinary experience with the Maguari Stork at the San Francisco Zoo on Wednesday, Nov. 1, 2006. The stork bent its neck 180º backwards touching its back to my utter amazement. I related this story on my "Crowned Crane" web page on Nov. 29, 2006. Sometime later I found a loose label from a Vlasic Dill Spears pickle jar in my refrigerator. The Vlasic Logo appears to be a Stork that is relishing a pickle. It was as though the Maguari Stork was still talking to me. So I visited the San Francisco Zoo again on Wednesday, Dec. 6, 2006. This time the stork appeared listless and tired. After repeated attempts to exhort the stork to bend his head to touch his back, I began pumping my arms and stomping my feet to Native American dancing and chanting "Heh! Ye! Heh! Ye!" The stork finally responded to my chants and did his 180º backwards head-tilt. As I was about to leave his cage, the stork gave one more amazing performance he spread out those black and white wings of his like a giant oriental fan to a flurry gust of wind, then flew to the top of a tree. It was truly a symphonic moment that caught me by surprise. And ever since, I feel the inspiration of flight within me, resolving to write a haiku each day to capture insights coming my way. Also, because of the Maguari Stork, I requested to work at Foothill College as a Computer Lab Consultant on Thursday instead of Wednesday (my assignment last semester), since the San Francisco Zoo has free admission on the first Wednesday of each month. When I learned of Robert Pinsky's Poetry Workshop at Stanford on Wednesdays, I felt as if this was another gift from the Maguari Stork. So I'm writing my first full-length poem of 2007 in honor of him. These notes are for my references in elucidating some points of the poem. "Whoo, Whooh, Whoo, Whoo, Whooh!" This song came to me during my Medicine Walk at Mt. Shasta (July 27, 1989) while meditating in a forest grove during a week of journal writing with Nina Holzer. She told me that's my sacred windsong to treasure. Whenever I see a hawk in the sky, I would chant it. Often the hawk would circle over me before flying away. some Hopi dance chanting "Heh Ye! Heh Ye!" This is a Native American chant that I learned from Charlie Thom "Red Hawk", Medicine Man from Mt. Shasta, during Sweat Lodges conducted by him (1989). Charlie is a Karuk Medicine Man, but I've used "Hopi" here to resonate with the Hoopoe bird in the final stanza, since the Hoopoe led the Conference of Birds to enlightenment in Attar's 12th century poem. his surprise parting gift to me that day. 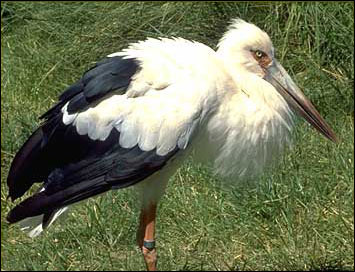 I didn't expect the Maguari Stork to fly after reading the Mercury News article of Nov. 29: "Because the Los Altos Hills-based bird can still fly, it is doubtful it came from a zoo, Healy and other zoo officials said. Zoo birds have their wings pinioned when they are young, a surgery where one of the wings is made shorter than the other." This way, zoo birds can't fly away. 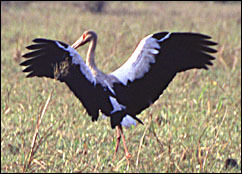 But the Maguari Stork showed me that day that he could indeed fly! November in the Ilanos; August through October in southern Brazil. To have a sort of Philosophical Back Garden. Or I should stop here quiet and comfortable in my theory of Nettles. The Hoopoe (Upupa epops) is in the same order of near passerine birds as the kingfishers and bee-eaters. It is about 27 cm long with a 46 cm wingspan. Its black, white, and pink color are quite distinct. Its erratic flight is like that of a giant butterfly. The song is a trisyllabic "oop-oop-oop", which gives rise to its English and scientific names. In Greek mythology, a man, Tereus, was transformed into the form of a Hoopoe. 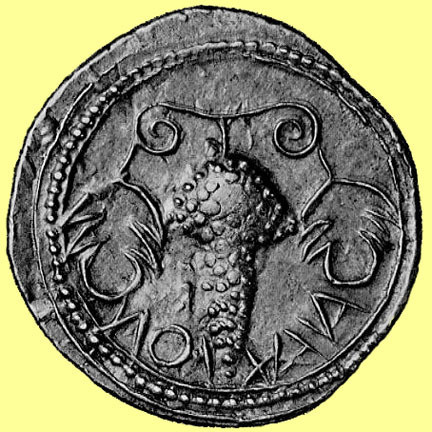 The character is featured in Aristophanes The Birds. In Islam, Hoopoe is associated with King Solomon (in Arabic, the Prophet Sulaiman) and the Queen of Sheba visit "And he reviewed the birds, then said: How is it I see not the hoopoe or is it that he is of the absentees?" (Koran, 27.20-28). In Chinese poetry, the Hoopoe is depicted as a celestial messenger often bearing news of the spring. 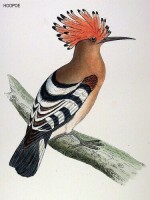 The Hoopoe is generally considered auspicious in China due to its unique beauty. The Hoopoe plays a central role in Attar's Conference of the Birds, a 12th century Persian poem, guiding thirty other birds in their pilgrimage to enlightenment. My two encounters with the Maguari stork made me feel that he could play a similar role guiding others to wisdom and illumination. I ended my first version of this poem with the lines: "And if you wish to meet a sage, just visit / San Francisco Zoo and the Maguari Stork." But then I remembered Selma Lagerlöf's story of Nils and felt that the Maguari Stork had lifted me up that day to see greater vistas. Since legends have storks bringing babies into this world, I too felt reborn and refreshed just as Selma experienced in her childhood. I recall many years ago reading about Selma's Memories of My Childhood Selma was paralyzed at the age of three and a half and couldn't walk. Her parents took her to the baths at Strömstad, hoping the spa would heal their small invalid. The seacoast town had many ships and fishing boats. Their landlady's husband was a captain of a ship which had come back from a long sea voyage. The five year-old Selma learned that the captain had a bird of paradise on board. Selma thought paradise had something to do with God, and wondered whether the exotic bird could heal her. In her eagerness, she forgot her weakness and walked to the captain's cabin and saw the exotic bird. Her parents attributed Selma's cure to the sea air and the spa of Strömstad. But Selma thought it was the Bird of Paradise that had cured her. [I found this story summarized in Hanna Astrup Larsen's Selma Lagerlöf in the Stanford stacks (PT9770.L3.1975), some 36 paces from my computer desk.] Perhaps it was this childhood memory that prompted Selma to write The Wonderful Adventures of Nils, where the boy Nils Holgersson was lifted aloft by wild geese all over Sweden learning about its history and folklore during that aerial journey. Likewise I've learned much from the Maguari Stork at the zoo, while writing this poem and these notes. Selma Lagerlöf was born Nov. 20, 1858 at Mårbacka, Värmland, Sweden. The $40,000 Nobel Prize award made it possible for Selma Lagerlöf to purchase Mårbacka, the estate near East Amtervik in Varmland, where she was born. It had been sold after her father's death. Here, with the scene ever before her, she wrote Mårbacka (1922), the memoirs of her family and her own early years. When Selma lost her ability to walk in childhood, the husky nurse, Back-Kaisa carried her around for two years. This poem was inspired by my two visits to the San Francisco Zoo and my interactions with the Maguari Stork. After the poem was completed, I realized that I had not consulted any books on the myth and symbolism of storks. So I'm adding some extra info from these books in my library. I'm joyful to learn that the stork is associated with noble qualities in most cultural traditions. That the stork also symbolizes wisdom is particularly meaningful to me as I continue to learn much from him. Stork: This bird, dedicated to Juno by the Romans, was a symbol of filial piety. It is also an emblem of the traveller. 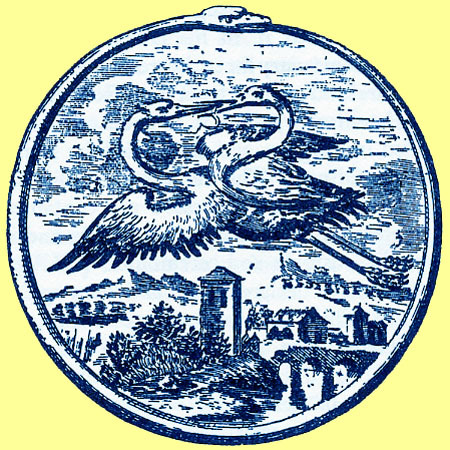 In the allegory of 'Great Wisdom', two storks are shown facing each other and flying within a circle formed by the figure of a snake (Bayley). Note: Serpent biting its tail is called Ouroboros.